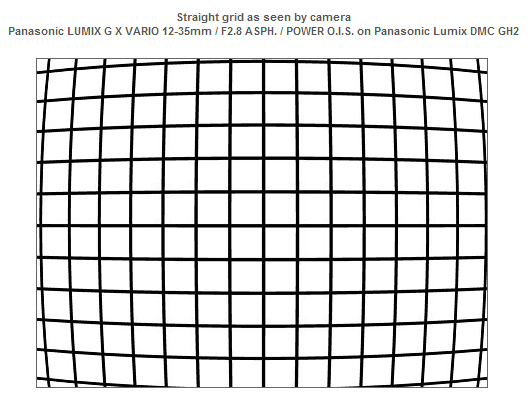 The Panasonic Lumix G X Vario 12-35mm f2.8 ASPH Power O.I.S is a high quality zoom lens with a Micro 4:3 mount. It will fit onto cameras from Panasonic and Olympus. The design is of 14 elements in 9 groups, 4 of the elements are aspherical, 1 is UED (Ultra Extra-low Dispersion) and 1 is UHR (Ultra High Refractive) Glass. The lens features nano-surface coating to improve transmission and contrast. The Focal length range of 12mm to 35mm covers the “standard” range, the relative focal length for full frame 35mm would be 24mm through to 70mm. The maximum aperture of f2.8 is fixed throughout the range and the minimum is f22. The lens is not designated as a macro lens and the minimum focus distance is 0.25m giving a maximum magnification of 0.17x. Autofocus on the lens uses a silent motor design and works during video capture. 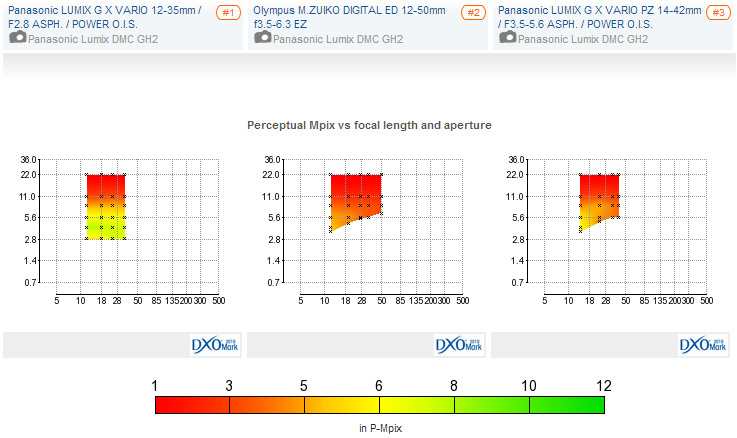 There is also ‘Power O.I.S: Optical Image Stabilizer which Panasonic claim to be twice as good as their previous system. As one would expect from a fast lens like this, it is quite solidly built, 68mm across, 74mm long and weighing in at 305g. 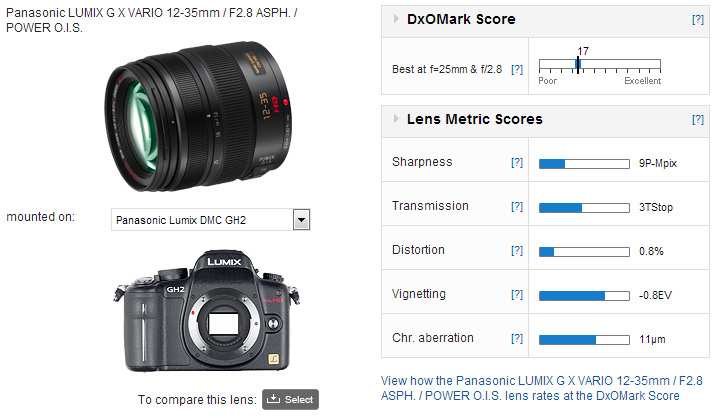 The first thing to say about the Panasonic Lumix G X Vario 12-35mm f2.8 ASPH Power O.I.S is that it is the highest scoring Micro 4:3 zoom lens that DxOMark has tested. With an overall score of 17 it beats any other zoom lens by a wide margin and scores reasonably against some very good fixed lenses too. The scores for Micro 4:3 are not very high, the best score for any lens being 23 (compared to scores of up to 40 for full frame 35mm). Taking a closer look at the individual scores does raise some concerns: Chromatic Aberration at 11µm is not very good; there are many lenses better than this, though these are fixed focal lengths. Distortion is also problematic, not taken as a whole but specifically when looking at the wide-angle setting where it is very noticeable. Vignetting is quite well controlled and sharpness at 9 P-Mpix is higher than most in this sector, however it does fall off as the aperture is stopped down (see Comparison). Here are 3 “standard” zoom lenses, each spanning the wide to short telephoto range. Panasonic’s 14-42 goes a little longer but not as wide while the Olympus matches the G X Vario at the wide end and goes even longer. Both of these competitor lenses are much slower and both have variable apertures, but they are also very much cheaper, much less than half the price. The DxOMark scores for the cheaper lenses are 10 and 10 against the 12-35’s score of 17. The chart would seem to suggest that all of the advantage that the 12-35 has is when it is used wide open, the scores between f5.6 and f22 are much closer together. 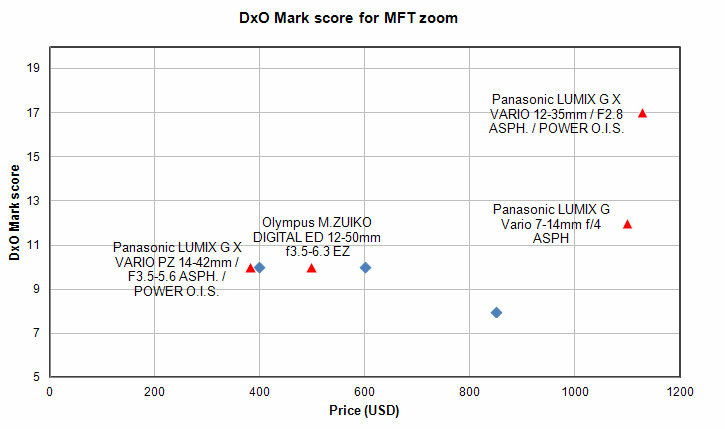 The DxO Mark scores are remarkably similar above f5.6. 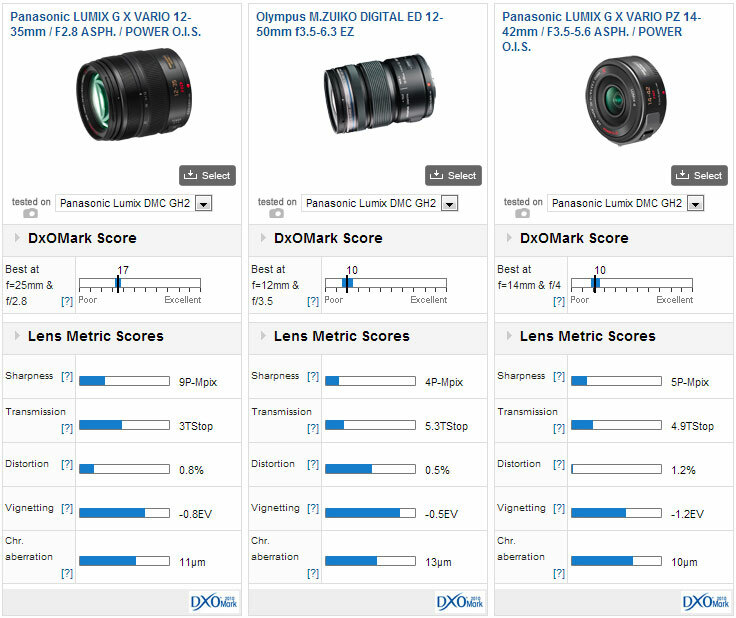 The score for Sharpness certainly favors the Lumix G X 12-35, it performs very well wide open at f2.8 where the other lenses cannot compete. At smaller apertures the differences are small. At wider apertures, between f2.8 and f5.6, the Lumix G X 12-35 is clearly much better but beyond f8 the differences reduce, It is probably best not to use any of these lenses at minimum aperture. To put things in perspective here are the best scoring 12mm fixed focal length and 45mm, a combination that some people might prefer. 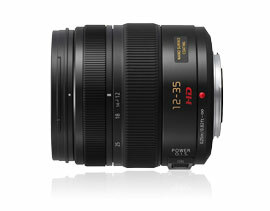 The combined price of these two lenses is similar to the Lumix G X 12-35 and their weight together is similar too. 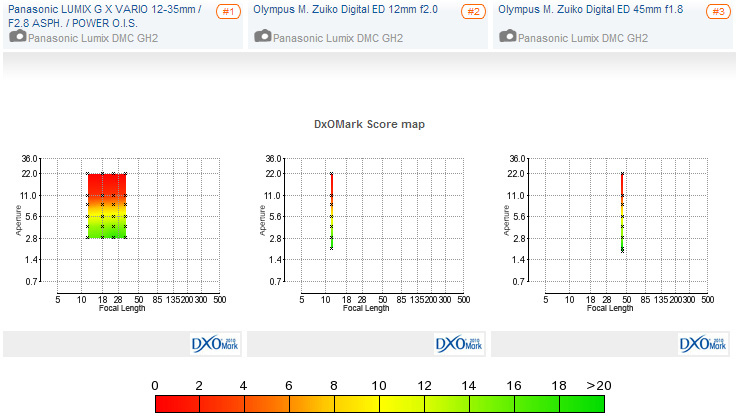 The DxO Mark scores are 19 for the 12mm and 20 for the 45 so slightly better. 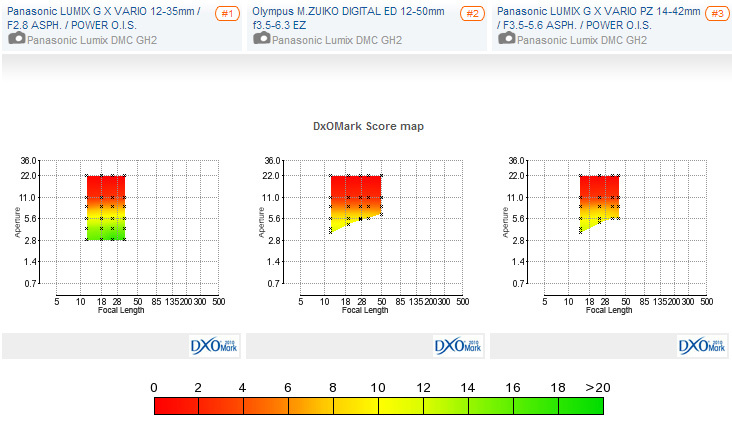 The Lumix GX 12-35 performs almost the same as the fixed lenses, both as well and as badly. 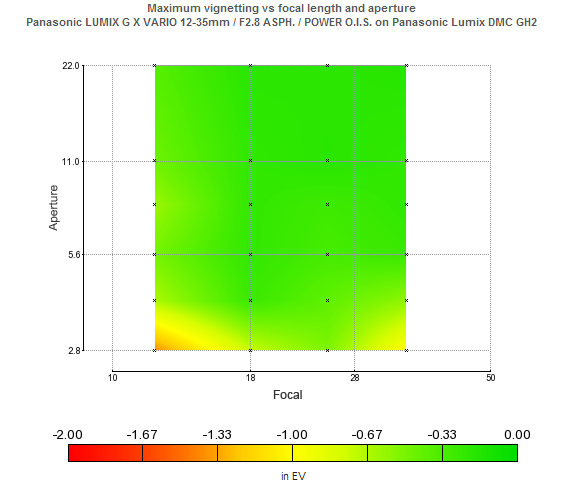 Again the results at comparable focal lengths are very similar. Micro 4:3 is a popular format, there is a wide range of cameras and lenses on the market, letting you choose the most appropriate equipment for the type of photography that you want to do. There are definitely combinations that will compete well with APS-C. However, in these examples there does seem to be a strong emphasis on the quality being weighted towards the wider apertures which may not always be what you want. The Panasonic Lumix G X Vario 12-35mm f2.8 ASPH Power O.I.S is the best lens of it’s type by quite a long way, but at a price that would buy better equipment if you are not wedded to the Micro 4:3 system.